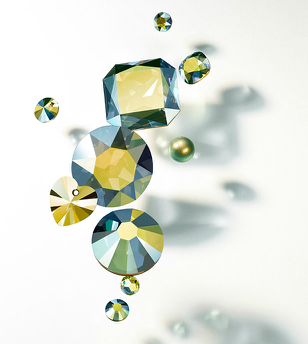 Sneak Peak: SWAROVSKI ELEMENTS New Innovations Spring/Summer 2015! Click on the link below to download an Excel Spreadsheet for all of the New Styles, Colors and Effects available for the Spring/Summer 2015 Swarovski Innovations. 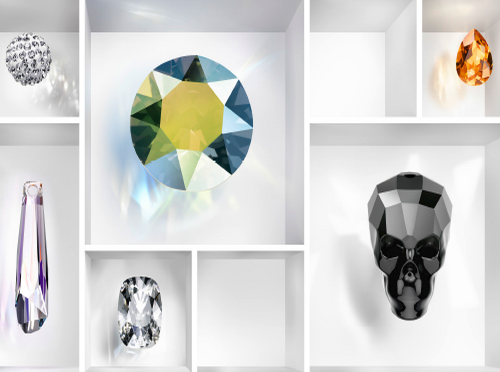 The brand New Swarovski Innovations for this Spring and Summer have been revealed! This is always an exciting time in the Swarovski world for all those who love to bead and create jewelry made with SWAROVSKI ELEMENTS! 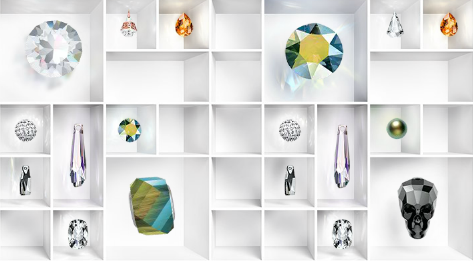 Swarovski introduces this year’s Spring/Summer 2015 collection with a revolutionary variety of fresh and innovative crystal styles, colors, effects or coatings including additional line extensions. Each unique color and effect bursts with a new-found vibrancy, energizing your creativity for the upcoming spring and summer seasons. The New Spring/Summer 2015 Swarovski Inspiration is defined as ‘Traces of Time’ which correlates to today’s shifting perceptions of age that introduces a novel way of experiencing its impact on choices, lifestyles, and esthetics. 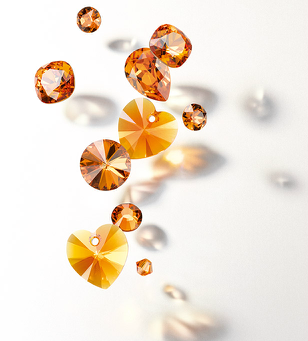 Tangerine is a gorgeous bold orange tone that adds a rich warmth to the Swarovski color assortment. It's complex vibrancy connects designers with a delightful romanticism as felt when reflecting on the pure and spontaneous beauty of sunrise or sunset. The exceptionally unique metallic glow of the Crystal Iridescent Green expresses a multitude of color combinations with hints of greens, yellows and blues shining through a mysterious metallic framework of timeless glamour and sophistication. The mesmerizing expressions of style and refinement compliment both traditional and modern designs. The eclectic color range is a perfect touch of an extra special sparkle that will embolden designs paired with neutral or beige tones such as Crystal Golden Shadow and Silk. 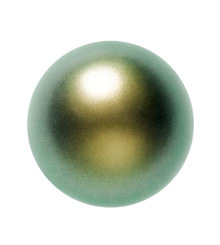 The groundbreaking modernization of the Crystal Pearls with the new Crystal Iridescent Green effect, displays a brilliant amalgamation of gold and green tones enveloped in a semi-matt pearlescent finish that is entirely original. The mysterious dual-tone effect shimmers with luminous radiance and is boastfully a new beauty that stands in a class of its own. The latest precision cutting technology has now made it possible to create the 5750 Skull Beads, an exceptionally unique masterpiece in crystal design. The highly sophisticated multi-layer cut offers exceptional subtlety and delicacy in its profiling of the skull. It is available in a 13mm and a 19mm in blue and black tones, gleaming metallics, or eye-catching effects such as Crystal Astral Pink and Crystal Aurora Borealis. These are an edgy extension of Swarovski’s crystal product range. 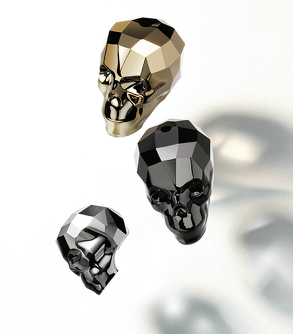 The Skull Bead fits perfectly with any expressive design direction. 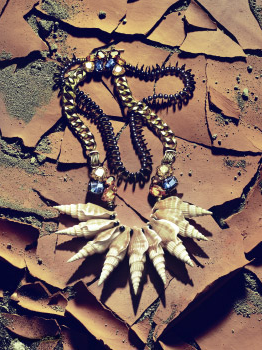 As a precision-cut crystal skull, it can be used to create romantic, tribal pieces when combined with other beads and natural materials. It is also ideal for darkly glamorous designs. The classic diamond shape of this Mini Rhombus shape is a beautiful and delicate new addition to the mini bead assortment. This is a timeless style that offers a sophisticated quality with brilliant multi-layered facets that adds remarkable versatility to designs. The Mini Rhombus Bead comes in a classic diamond shape and is a beautifully delicate addition to the mini bead portfolio. Offered with the same sophisticated, brilliantly multi-layered cut, and in the same 6 mm and 8 mm sizes as the popular Round, Oval, and Square minis, it also comes in 11 effects and 8 colors. Its small size makes it the perfect choice for layering into delicate and intricate looks, or it can be used to offset bigger stones. This versatility extends to both masculine and feminine designs, and it looks great when used to add a striking sheen to graphic patterns. How to use: Beading, stringing, wiring, sewing, weaving – everything is possible with the Mini Rhombus Bead. Combine with the existing mini bead portfolio (its hole length matches the Swarovski 5052 Mini Round Beads and the Swarovski 5053 Mini Square Beads) to create opulent designs using many beads, or subtle highlights using a select few. As a versatile cut offering myriad combination possibilities in size, pattern, and color, the classic rectangle shape that the Mini Rectangle Bead offers, is ideal for use in DIY designs, and to create precious highlights in jewelry. They are available in the 8×6 mm and the 10×8 mm. Convincing as a minimalist and refined design element, it looks great as a standalone feature or in combination with other materials and will never go out of fashion. Although each cut has its unique fascination, the Mini Rectangle is offered in the same range of colors as other mini beads to make the mini bead family even more dazzling in its unity. (contact us for more color options than what is listed on line). The 5056 Mini Drop Bead features the definitive teardrop shape and is a beautifully delicate addition to the mini bead portfolio. A sophisticated juxtaposition of a soft shape with a geometric cut, the Mini Drop Bead offers superb versatility and is ideal for updating any design. Available in the 10×6 mm and the 12×8 mm sizes, it also comes in 11 effects and 8 colors (contact us for more color options than the ones listed on line). This brand new design from Swarovski is a modern interpretation of a classic cut displaying dramatic and spectacular chaton-cut faceting structure fashioned into a drop pendant that is perfect for both elegant and futuristic designs. For the first time its colorful effect is applied from the top, rather than the side, to achieve a homogenous look. When seen from the side it has a classic appearance, but when viewed from below, the masterpiece of a dazzling kaleidoscopic effect is revealed. Its conical shape adds sculptural volume, which meets the current demand for architectural pieces and progressive 3D design. It is particularly effective when used to create stand-out statement pieces, and when combined with smaller sizes its water-inspired droplet shape has an exciting nature-tech appearance. This exceptional style can be utilized in necklaces, earrings and eye-catching charm bracelets that are available in a 14 mm, 24 mm, 32 mm and a 33 mm. The kaleidoscopic complexity of the XIRIUS cut finds its match only in nature’s miracles: captured in the new XIRIUS Raindrop Pendant is the beauty and wonder of a fresh summer shower. The drop motif is the perfect embodiment of Swarovski’s most brilliant crystal. Look at it from the side—a classic. Look at it from below—a phenomenon! These brand new Swarovski Crystal Pavé Balls are simply stunning and make a true style statement! Ground-breaking technology of this crystal Pavé look unites Ceralun™ technology with brilliant Swarovski Chatons, giving it a spherical shape for ultra-versatility. The uniqueness of this stylish bead comes from its combination of matte and shine which features a multi-sensory sensation displaying a myriad of tiny spherical crystals that offer easy-to-wear, versatile glamour. How to use: These berry shape 86001 Pavé Balls are available in a range of sizes including a 4mm, 6mm, 8mm and 10mm along with a variety of gorgeous colors, providing a range of creative and easy-to-wear design opportunities for elegant, joyful and individual looks that gracefully sparkle. The elegant tone-on-tone material and variety of colors available make Pavé Balls an asset in every design – whether used individually, threaded together, or alongside other decorative elements, together these little crystals can add either a touch of sparkle or be the wow factor in your design. This lovely and playful 8mm Butterfly shaped Flatback is now available in the Hotfix form, offering new easy application opportunities for all kinds of designs, uniting both beauty and function. This classic Butterfly cut is a feminine and youthful style ideal for nature-inspired designs. With its Rivoli cut and flat table, it is also suitable for creating fanciful transfers. The Butterfly is a timeless symbol that is particularly appealing in children’s wear, lingerie, and bridal wear or for adding a hint of nature-themed nostalgia. A symbol of freedom and happiness, the Butterfly is an airy, romantic, and timeless shape. Young and playful, it is ideal for children’s wear, as well as offering a poetic, wildlife-themed look for nature lovers. Its figurative design will appeal especially to the Asian market. · Application by heat press. · Same applicability with all Creation Transfers Plus. ·Recommended application side: the back (reverse) of the fabric is exposed to the heat press. These items are not suitable for application from the front. ·The use of a transfer film may be helpful to assure that the crystals are kept in position and also to be able to turn the fabric. The very unique new Bow Tie Flatback is available as Hot Fix and No Hot Fix for a youthful and playful appeal. This innovative style is available in a 6×4.5 mm, 9×6.5 mm, and a 12×8.5 mm in a wide rage of colors offering a classic versatility that works with romantic, feminine looks as well as strong and lean designs making the Bow Tie Flat Back both iconic and fun. This classic shape is so versatile: perfect for children´s wear, and for having fun with cute, feminine looks, as well as creating grown-up elegance. It is a must-have for fans of figurative design and looks especially effective when applied side-by-side, used to create patterns and can also be applied as Transfers. The application and usage information is the same as the Butterfly Flatback Hotfix listed above. The new Swarovski 3018 Rivoli Button, with it’s stunning Rivoli faceting structure, is offered with four holes. This is a unique and elegant addition to the button family that adds more versatility and functionality to the design world. It will complement any design, fulfilling women’s current demand for stylish simplicity as well as adding a touch of sophistication to menswear. The Rivoli Crystal Button (4 holes) is extremely easy to apply and can be used as a functional button on clothing, a decorative button on accessories, or as a stunning embellishment in interior design. Cut simply to look like a bow tie or bow, the Bow Tie Sew-on Stone has a youthful and playful appeal. Offering a classic versatility that works with romantic and feminine looks as well as strong and lean designs, the Bow Tie Sew-on Stone is both iconic and fun. Perfect for bringing classic knits up to date. This classic shape is so versatile: perfect for children’s wear, and for having fun with cute, feminine looks, as well as creating grown-up elegance. It is a must-have for fans of figurative design. The new Bow Tie Sew-on Stone can also be used for jewelry. · Application by hand, with a standard domestic or industrial sewing and embroidery machine. · Synthetic multifilament with a thread count of Nm 80 are most suitable because they are more resistant to abrasion. · If using a sewing machine deactivate the transport system to avoid any movement of the fabric. · Select the over edge stitch. · The element can only be applied by removing the standard presser foot because of the height of the article. The new 6022 XIRIUS Raindrop Pendant is a stunning chaton-cut drop pendant is ideal for both elegant and futuristic designs. For the first time its colorful effect is applied from the top, rather than the side, to achieve an even look throughout the piece. When seen from the side it has a classic look, but when viewed from below a dazzling kaleidoscopic effect comes into play. Use these beauties as an eye-catching necklaces, earrings and charms for bracelets. Its conical shape adds sculptural volume, which meets the current demand for architectural pieces and progressive 3D design. It is particularly effective when used to create stand-out statement pieces, and when combined with smaller sizes its water-inspired droplet shape has an exciting nature-tech appearance. The kaleidoscopic complexity of the XIRIUS cut finds its match only in nature’s miracles: captured in the new XIRIUS Raindrop Pendant is the beauty and wonder of a fresh summer shower. The drop motif is the perfect embodiment of Swarovski’s most brilliant crystal. Look at it from the side—a classic. Look at it from below—a phenomenon! The Crystalactite Pendants are an exciting, contemporary interpretation of a natural stalactite and were developed in collaboration with the renowned fashion house Maison Martin Margiela. The Pendants reflect Margiela’s Crystalactite haute-couture pieces with their strong, modern look and sophisticated cut enhanced with matte facets—a work of art with timeless appeal. Together with an easy-to-apply hole at the top, the Grand and Petite Pendants offer myriad design possibilities for strong, contemporary designs, and for recreating haute-couture looks. The Grand Crystalactite partly frosted (art. 6016/G) features the Maison Martin Margiela logo, while the Crystalactite Pendant Grand partly frosted (art. 6017/G) comes without the logo. The same is valid for the Petite Pendants: The Petite Crystalactite partly frosted (art. 6018/G) features Maison Martin Margiela’s logo, whilte the Crystalactite Pendant petite partly frosted (art. 6019/G) comes without the logo. Please contact us for order details. The gorgeous and classic 4470 Cushion Cut Fancy Stone is now being made in the subtle pink hue of Rosaline. A beautiful addition to the many colors and coating offered in this popular style. (please contact us for more color options than what is listed on the website). The new 4568 Cushion Cut is an elegant new Fancy Stone with a pointed back, inspired by classic gemstone cuts.Numerous colors and effects for the Cushion Fancy Stone are also available without foiling, making it ideal for exclusive and elegant designs. Versatile, modern, and sophisticated, this classic cut and shape is perfect for combinations and fits any design direction. Create confident statement pieces with maximum brilliance, or use this cut with natural materials for a tactile, romantic style.